Retail start-up needed an experienced consultant to lead them through their marketing strategy. Bull Tactical Outfitters was a brick-and-mortar tactical outfitting retail store located in Austin, Texas. The owners, Lance and Kelli Bullington, spearheaded their business in early 2003, striving to fill a desperate need for a reliable, conscientious tactical outfitter in central Texas. Lance, in his 13 years of service in both the armed forces and law enforcement, was constantly frustrated with the lack of resources to purchase the tactical gear and supplies his careers required. He and Kelli committed to the ambitious goal of launching both a retail store and complete online presence for their new company by the end of the year – a goal made even more challenging by the fact that neither of them had any previous experience with retail or online businesses! Because Kelli was leaving behind her career as a mechanical engineer to become the business manager, she was actively trying to learn the ins and outs of her new roles. We spent a substantial amount of time discussing her overall online presence, and I was able to offer her my expertise on a number of online issues. Initially, Kelli hired me to implement an ecommerce solution for their new website, as well as a simple interim solution for processing credit card orders until the larger ecommerce system was in place. She had another designer creating the website, and I assured her that I would make every effort to integrate my project seamlessly into their larger design. As the ecommerce project was coming to a close, Kelli approached me with the request to take over the design and development of their website in its entirety. She was concerned with the rate of progress on the project and her deadlines were fast approaching. Lance and Kelli are, perhaps, the most interactive clients I have ever worked with. They knew their market and came to the table with innovative and interesting ideas for their online presence, while allowing me to guide them toward the most advantageous ways to accomplish their goals. We prioritized the the site development to maximize our resources, giving us a speedy launch of core elements, followed quickly by bells & whistles to make the site unique. Once their ecommerce system was in place and customized, I created a custom maintenance manual for their common tasks and spent time training the staff on product entry and system use. As they continued to expand their online catalog, I set to work creating a static HTML website for the information side of their site. Their target audience was primarily male, and Kelli wanted to balance engaging technology with useful, simple pages. 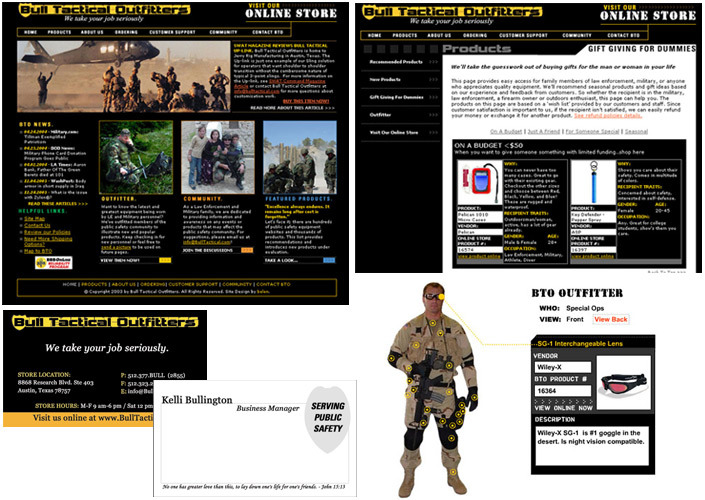 Interactive Flash “outfitters” were developed to show tactical gear on a person, creating a direct merchandising link to each product. Within 6 weeks, their site was ready launch with a complete online store, informational website, and interactive elements – plus future plans for community pieces and more interactive resources! Bull Tactical Outfitters opened their real-world and online ventures to an eager audience. Through their continued efforts to improve, expand and innovate their business, they have earned a reputation for excellence in their field, and their website received praise from partners and customers alike. Next post: Welcome…here’s your decoder ring.